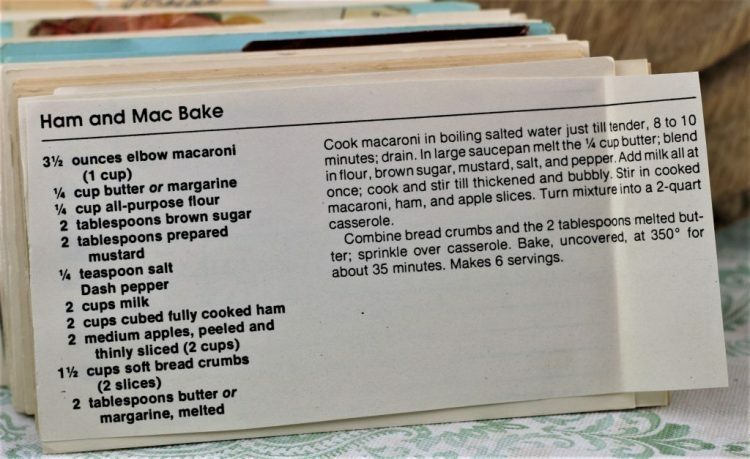 Front of the recipe card for Ham and Mac Bake. 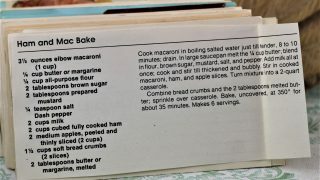 There are lots of fun recipes to read in the box this recipe for Ham and Mac Bake was with. Use the links below to view other recipes similar to this Ham and Mac Bake recipe. If you make this Ham and Mac Bake recipe, please share your photos and comments below! Cook macaroni in boiling salted water just till tender, 8 to 10 minutes; drain. In large saucepan melt the ¼ cup butter; blend in flour, brown sugar, mustard, salt, and pepper. Add milk all at once; cook and stir till thickened and bubbly. Stir in cooked macaroni, ham, and apple slices. Turn mixture into a 2-quart casserole. Combine bread crumbs and the 2 tablespoons melted butter; sprinkle over casserole. Bake, uncovered, at 350° for about 35 minutes. .